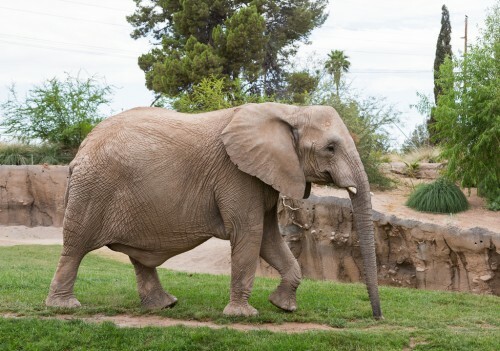 Reid Park Zoo is throwing an elephant-sized baby shower for Semba, a pregnant African elephant, June 29 8-10am. Although Semba’s calf is not expected for a few more weeks, any pregnancy lasting 22 months deserves a party! This is the first elephant pregnancy at Reid Park Zoo so staff is particularly excited about sharing this special time with the community. Education staff will be on hand with crafts, activities, shower games, and giant card for guests to sign to welcome baby when he (or she!) arrives. Keepers will demonstrate and share information about Semba’s pregnancy care routine including stretching, foot care, and body conditioning. 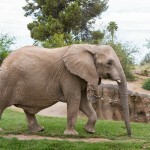 The Zoo will offer free tours of the Elephant Care Center at 9:30am. Staff will even have cupcakes for the first 100 guests as well as a special healthy “cake” for the whole elephant herd to enjoy, along with a few food “gifts” for them to open. For guests interested in helping prepare for the calf’s arrival by donating or bringing a “shower” gift, keepers have carefully selected items that will most helpful. Supporters can check the Zoo’s website, here, for instructions on how to make a contribution for a specific gift through the Reid Park Zoological Society. For those who can’t make it to the party, Keepers will be posting updates regularly on the Zoo’s website. A baby blog, recent photos, and suggested ways to help can now all be found on the Zoo’s Pachyderm Pregnancy Page. Guests should check the site regularly over the next several weeks as Semba gets closer to her delivery day.